Set in an alternative 1970s timeline, this story driven adventure game pits players as UN Secret Service Spies against SMERSH. SMERSH is an acronym of two Russian words that translates into "Death to Spies." It operated as a counter intelligence agency by the Red Army during the 1940s. Despite having had a large number of paid employees, little was known about the agency until recently when Russia opened their archives. Agents of SMERSH is similar vein to Tales of the Arabian Nights - except game play is expanded, including custom dice to determine success or failure of encounters, and more strategic play from what is typically expected of a Storytelling board game. There are plenty of James Bond gadgets and pop references and detailed artwork - not to mention a touch of humor. 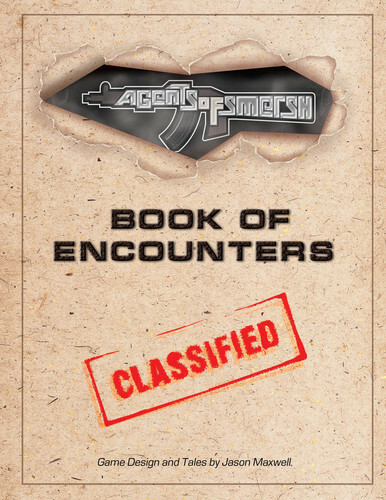 As an optional reward for Kickstarters, Agents of SMERSH comes with a giant book of encounters that adds around 1500 expanded encounter experiences to the base game. The game features the artwork of George Patsouras (The Resistance & Flash Point). 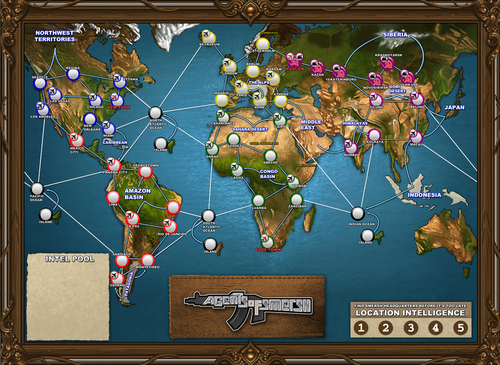 If you enjoy role playing games where adventure is as fun as winning you’ll enjoy “Agents of SMERSH”. This is a co-operative choose your own adventure book played out over the board. Components: 9 You’ll get your money’s worth. The customizable d6 and the story book go a long ways. There are so many pieces we initially found it overwhelming – this isn’t bad though as they all play together. Complexity: EASY But since there is a lot going on and a hefty rule book folks will feel intimidated. This one won’t burn your brain. There are a few decisions to make and how to balance the use of your intel is not intended to measure your IQ. This really is a choose your own adventure. Victory: 6 Challenging and victory seems to be achievable. Though our play group hasn’t won. Since this is co-operative you’ll be working together. Win as a team, die as a team. Fun: 9 This game is very fun for those gamers who enjoy story telling or adventuring. There are some great encounters here and the author did well to add some humor too. 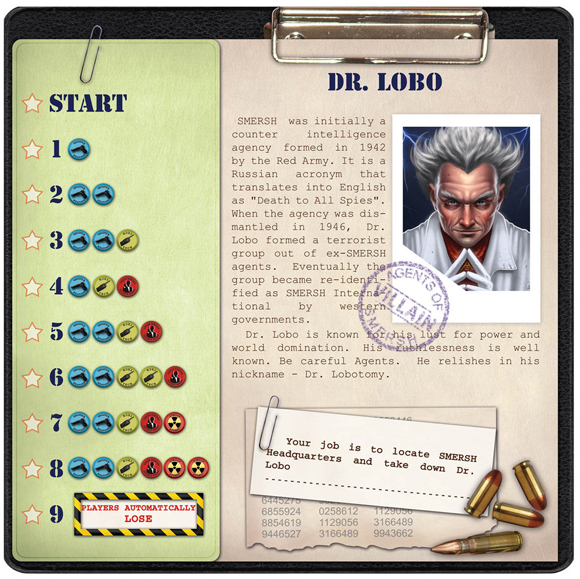 As an international agent you’re sent to track down the elusive evil Dr Lobo. By visiting cities across the globe you’ll have interactive encounters with outcomes that change with every decision you make =) Successfully completing encounters using customized d6 =) will help you collect intel, uncover henchmen hideouts and ultimately trace the whereabouts of your nemesis. Throughout your journey you’ll have a chance to customize your spy – do you prefer stealth? weapons expert? disguise? This is an adventure game; one where you’ll be reading through stories to interact with the game and pass skill checks using d6 to receive rewards or penalties. What agent would be complete without increasing skills and collecting powerful gadgets & weapons? Collect these as the game progresses. 1. Encounters allow you to choose from a list of 7 or more responses. These responses result in a specific action/ skill check appropriate to your decision. In one example I chose “disguise” which allowed me to board a private yacht of a known terrorist, befriend, get close and assassinate him before snatching a briefcase and return it to HQ. 2. The customizable d6 are high quality and not equal in there ratios since one dice may have 3 success and another may only have one. You’ll be drawing from a bag of dice to determine which ones you have available during your skill check. This adds some well needed variety to rolling/chance and builds tension before you even have to roll. 3. 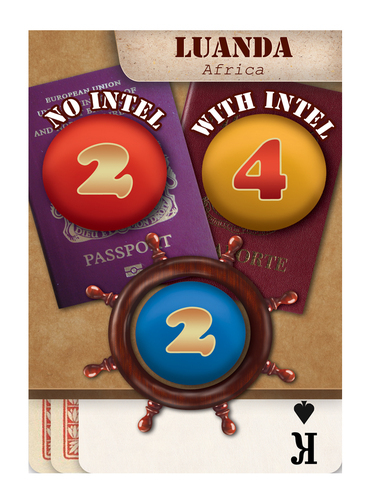 The intel matching mechanic is blind draw and the locations where intel is located is constantly moving. You’ll never know the type you’ve collected until the end of the game and only hope that you’ve collected enough matching intel to reach the victory condition. Since the victory conditions change and increase as the game progresses you’ll always be balancing your speed of capture vs collecting more intel. I prefer games that are quick to play or are lightweight(not all that strategic.) I was talked into this by my group and it is unfortunately everything I don’t like in a game. So, while I’m sure that there are many people who like this type of game I will not add an explanation of the game as I don’t think I will do justice to it. Apparently, it is not enough to say I don’t like it and why I must be verbose about it to. Maybe I should make the title of this ‘You Spy’ because in this game you play the spy! I played this game with my friend once and it was fun. 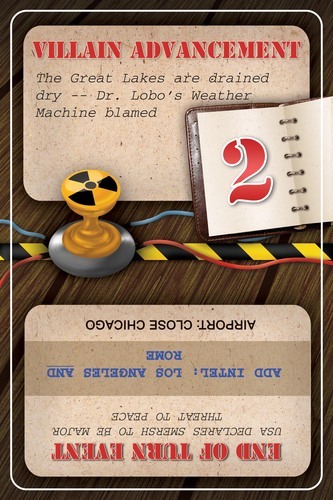 In this game – you are a spy and the other players are spies. You have to stop the Villain team before they become too strong. The villain is Dr. Bolo and he sends his helpers around the world to do things. You go around the world to do things to try and stop them. How to do this? Read a book! When you go to a place you read a story from a book and figure out to do things to get rewards or help. If you go to a city you might read about fighting someone or stealing plans or there is a car. Oh no! I am the computer spy! I cannot fight the bad guy. But if I go to the city again it might be a story about computers so I am ok. The stories are cool but random because you might not be the spy to win the story and then the evil get points. What points is this game? Zero-zero-SEVEN! 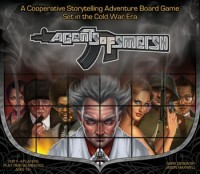 Add a Review for "Agents of SMERSH"